Uma escola de pensamento keynesiano-estruturalista no Brasil? 2011. 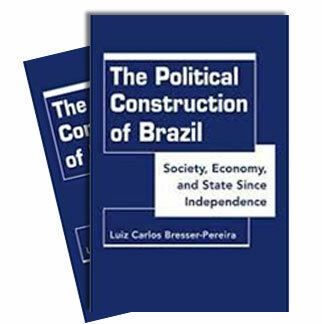 A new Keynesian-structuralist school of thought is emerging in Brazil, formed by a Structuralist Development Macroeconomics that offers scientific explanation to New Developmentalism. (Paper: Revista de Economia Política). Macroeconomía estructuralista del desarrollo: un segundo momento del estructuralismo Latinoamericano? 2012. With Paulo Gala. A summary of the structuralist development macroeconomics: the theory that is behind new developmentalism, the national development strategy required for catching up. Portuguese version available. (Paper only in this website). 2010. With Paulo Gala. A summary of the structuralist development macroeconomics: the theory that is behind new developmentalism, the national development strategy required for catching up. Spanish version available. (Paper Revista de Economia Política). 2010. What is new developmentalism? And structuralist development macroeconomics? To which extent is Brazil adopting it? Short answers to these three questions. (Article: Nueva Sociedad)). 2010. The four articles of my debate with prof. Affonso Celso Pastore on whether or not "foreign savings" (current account deficits) contribute to investment and growth. 2010. With José Luís Oreiro. Populist Keynesians are for chronic public deficits. Keynes only supported budget deficits in recession moments, and to finance investment, not current expenditures. (Article: Valor). 2010. With José Luís Oreiro. Populist Keynesians are for chronic public deficits. Keynes only supported budget deficits in recession moments, and to finance investment, not current expenditures. (Article: La Onda digital). 2008. With Lauro Gonzales e Cláudio Lucinda. Differently of what says conventional economic analysis, the cause of the 1990s financial crises in Mexico, Asia, Brazil and Argentina was not primarily fiscal, but the decision of governments to grow with foreign savings, i.e., with current account deficits. (Paper in Nova Economia). The tendency to the over-appreciation of the exchange rate. 2008. In developing countries there is the tendency to the overvaluation of the exchange rate. If countries do not neutralize it, they will experiment slow growth, and catching up will not happen. (Chapter 4 of book to be published, Globalization and Competition). Spanish version and Portuguese version available. 2007. With Paulo Gala In João Sicsú e Carlos Vidotto, orgs. (2008) Economia do Desenvolvimento. Teoria e Políticas Keynesianas. Rio de Janeiro: Campus: 79-96. 2007. Paper comparing three growth strategies: old or national-developmentalism, new developmentalism, and Washington conventional orthodoxy - actually a form of neutralizing the catching up of medium income countries. English, Spanish, and Portuguese versions available. (Paper: Passages de Paris). 2007. 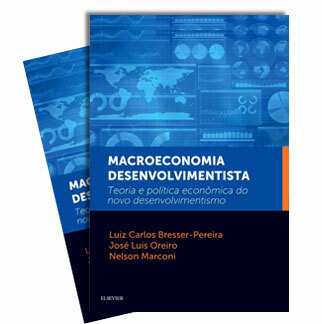 Interview to Cristiane Barbieri on Bresser-Pereira's latest book Macroeconomia da Estagnação. New developmentalism is a third discourse between old developmentalism and conventional orthodoxy. (Interview: Folha de S.Paulo).